Before Branson, Missouri became the music mecca it is today, it gave roots to a fellow by the name of Dusty Rose who made a name for himself in the hillbilly music field. He had a recording contract with Fabor Records back about 1955 or so. Later on, Dusty moved west to Oregon in 1948. He decided to try radio work and for a time was heard over KWRO in Coquille, Oregon. 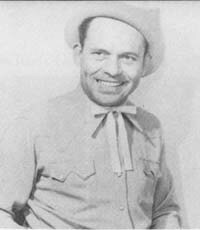 It was while he was there that the Maddox Brothers and Rose heard him doing his song, "Beautiful Bouqet" and eventually recorded it themselves. And even did a few more of his tunes after that which gave Dusty's career a bit of a boost at the time. It was another Fabor recording artist, Ginny Wright, who brought Dusty to the attention of the label owner, Fabor Robinson (who also owned Abbott records). His initial releases were "The Birds And The Bees" and "It Makes Me So Mad". Along about 1955, he was up in Roseburg, Oregon, doing a daily disc jockey show and also handling a Saturday amateur show that showcased the local talents. Dusty's wife, Betty, was also a part of his shows.